Early risers were greeted by wet streets this morning indicating some overnight rain. 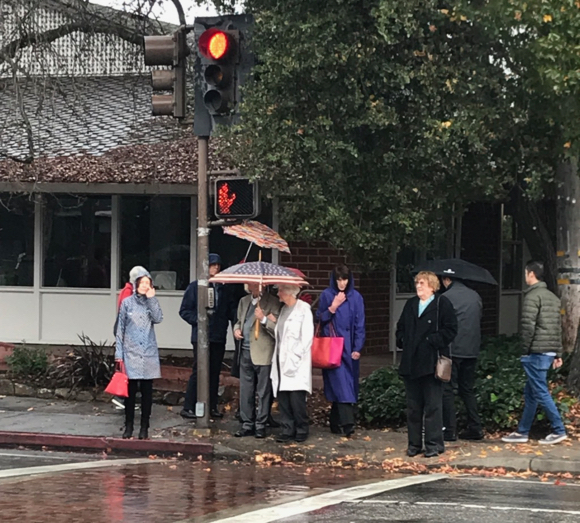 Later in the morning the skies opened again, with a mini drenching that caused umbrellas to open up in downtown Menlo Park. Reports InMenlo weather watchers Sally and Bill Russ: “There was indeed a bit more than a trace… .05” [every little bit counts, however, and we were both surprised it was raining at all when we looked out the window this a.m.]. So, that makes a total year to date of 8.8”. If you want to compare to last year, 2018, on this very date was 7.95”. More rain is expected tonight.